On Expedition 3, we'll leave the northern hemisphere behind and travel to the bottom of the world: Antarctica. We'll camp out in tents with three teams of scientists studying two very different subjects: First, we'll look at the biology of the frigid, bountiful Ross Sea through the eyes of Adélie penguins. Then we'll tackle the geology of 300,000-year-old lava flows high on Mount Morning, a dormant volcano in the towering Royal Society Mountains. We'll work round the clock thanks to the 24 hours of daylight and we'll enjoy summertime temperatures that might even get above freezing. Though penguins and lava don't have much in common, the scientists do have one subject in common: climate change. Scientists have been studying penguins here for more than 50 years, and now their combined observations are helping them see some of the effects of our warming planet. Meanwhile, up on the volcanoes, geologists are trying to piece together a much older puzzle: How long has the massive East Antarctic Ice Sheet been frozen in place? Join us in Antarctica this winter (Antarctica's summer). With Live from the Poles daily coverage, you won't miss out on anything but the frostbite! Penguin biologists David Ainley, of H. T. Harvey and Associates, and Grant Ballard, of the Point Reyes Bird Observatory, are going to opposite ends of Ross Island to continue a 55-year-long study of Adélie penguins. It's very rare for biologists to get a chance to study a species for so long, especially when that species lives on the coldest, driest, and most inaccessible continent on Earth. Ainley and Ballard will keep track of penguins as they build nests, search for food, and raise chicks over the summer. They'll follow the penguins' movements using small instruments glued to the birds' feathers. They'll also use an ingenious weigh-in system to keep track of how much food penguins are bringing back to the nest. But Ainley and Ballard aren't just learning about penguins. They're also watching what the penguins tell us about our changing world. Increasing temperatures and fiercer snowstorms in recent years have changed what's "normal" for Antarctic weather. And the effects of whaling are still being felt in Antarctic waters, affecting the penguins' food supply. Ainley and Ballard can use their half-century penguin study to interpret how Antarctica itself is changing. Learn more about Penguin Research at penguinscience.com. Woods Hole geologists Mark Kurz and Adam Soule, and graduate student Andrea Burke, are going to Mt Morning to learn how quickly cold weather can destroy rocks. In the incredibly dry atmosphere of Antarctica there's virtually no water to cause erosion. And in some areas like Mt Morning there's very little snowfall, either. But ice underneath the rocks still expands and contracts as the temperature fluctuates from around freezing (32ºF) to –50ºF or colder. During the region's nearly six-month summer of continual daylight, the Sun can even heat the rocks enough to melt patches of snow. This slow freezing and thawing eventually breaks apart the rock and sometimes pushes the pieces into odd, geometrical arrangements. It takes a long time – scientists still don't know how long. By studying the condition of the Mt Morning lava flows, where the lava's age is quite well known, Kurz and Soule can get a much better calibration of the rate of breakdown. Then they will use that rate in other parts of Antarctica, to learn how long those landscapes have sat uncovered by ice. On Expedition 3, we'll visit two penguin colonies, and we'll collect rocks and map lava flows at a dormant volcano called Mt Morning. 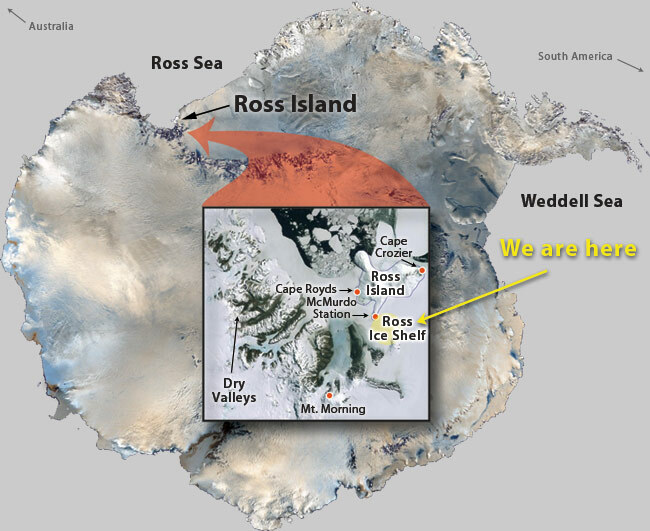 Cape Royds, Ross Island – About 15 miles north of McMurdo Station, Cape Royds was once home to the Antarctic explorer Ernest Shackleton. His hut, built almost exactly a century ago, still stands here. Today, Cape Royds is the summer home of about 4,000 Adélie penguin pairs and their chicks. David Ainley has been studying these little penguins of the Ross Sea for nearly 40 years. 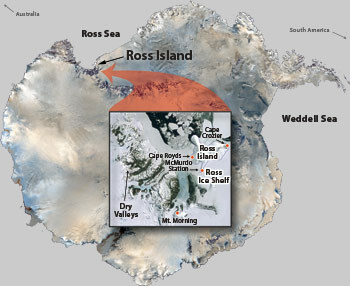 Cape Crozier, Ross Island – Both Cape Crozier and Cape Royds are points of land created by lava flows that tumbled out of Mt Erebus, the 12,448 foot active volcano at the center of Ross Island. At the eastern end of the island, Cape Crozier sits on high bluffs 800 feet above the ocean. The sea ice below is where the world's first emperor penguin breeding colony was discovered in 1903. Keeping them company are some 100,000 pairs of Adélie penguins. We'll join Grant Ballard, Ainley's colleague, in the midst of this squabbling mass. Mt Morning, Royal Society Range – Across the waters of McMurdo Sound the peaks of the Royal Society Range stretch north to south in a chain of mountain ranges that crosses Antarctica. About 50 miles southwest of McMurdo, at the southern end of this range, lies Mt Morning. We'll fly to the base in a helicopter, then ride snowmobiles to our camp on the mountain's northern flank. We’ll pitch camp in a snowfield so that we'll have plenty of ice to melt for drinking water. We'll be camping at the edge of a series of lava flows that erupted from Mt. Morning between 25,000 and 300,000 years ago. At one nearby spot, the lava comes to an abrupt halt in a cliff face – a lingering reminder of when the red-hot stream of rock flowed against the side of a glacier and stopped in its tracks. Safety Reminder – We don't have to worry about polar bears invading our camp. Polar bears live only in the Arctic. Antarctica has no large land animals. Learn more in our Compare the Poles section.